What does this mean? Well, to show you I downloaded all of the English wikipedia (and you can too here). 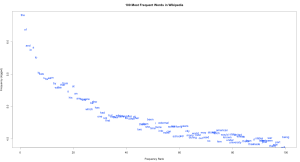 The entire wikipedia data dump is a pretty sizable dataset (a couple billion words), but I just took a sample of 36.8 million words to make dealing with the data a little faster and easier. Still, it’s safe to say it’s probably a statistically significantly large dataset. In those 36.8 million word tokens there are over 580,000 word types – everything from people city names to city names to obscure plant and disease names and more common words like the ones you’re reading right now. Of those 580,000, nearly half (280,000) occur just once in the sample. As you can see, it follows a neat logarithmic curve. And you can also see that most of these words are generally short and grammatical. 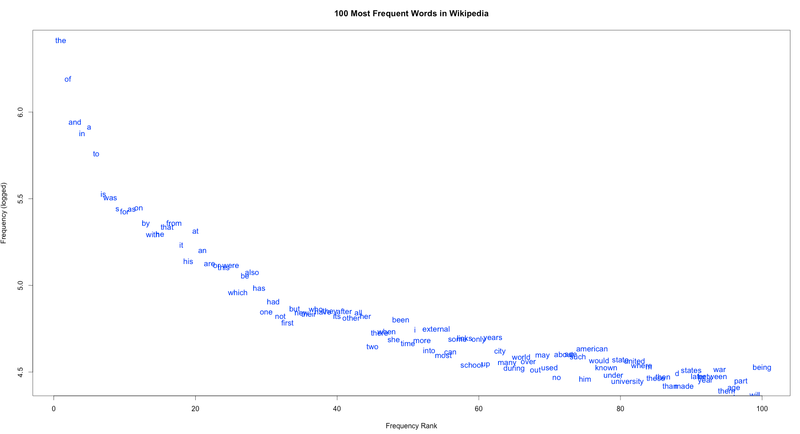 For example, the occurs 2.4 million times in the 36.8 million word sample: over 6% of all the words you read on wikipedia is the word “the”! Next we have of, occurring nearly 1.3 million times (that’s over 3% of the words you read! ), followed by and, occurring just 1 million times (a bit less than 3% of the words). As we get lower on the graph, we start to see lexical words like american, state, university, and war, each occurring around 30,000 times. These are probably a reflection of the articles I happened to pull in my random sample, and not a reflection of the English language as a whole. 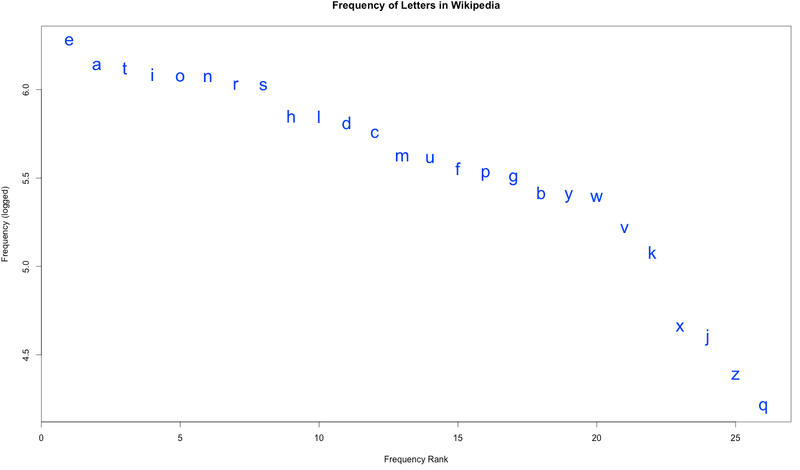 At around 5 letters per word, 36.8 million words would have something like 200 million letters, which is a bit too much data for my computer to handle. 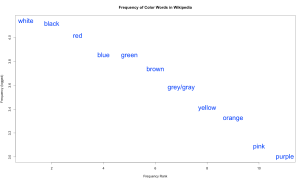 So for this graph I used just 3 million words. But again, we see the logarithmic curve, with E occurring almost 2 million times (nearly twice for every three words, on average), and Q occurring just 16,000 times. 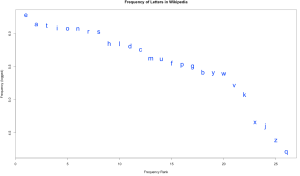 This distribution also gives you a sense for why certain letters are worth more in games like Scrabble and Words with Friends. Again, the logarithmic curve. 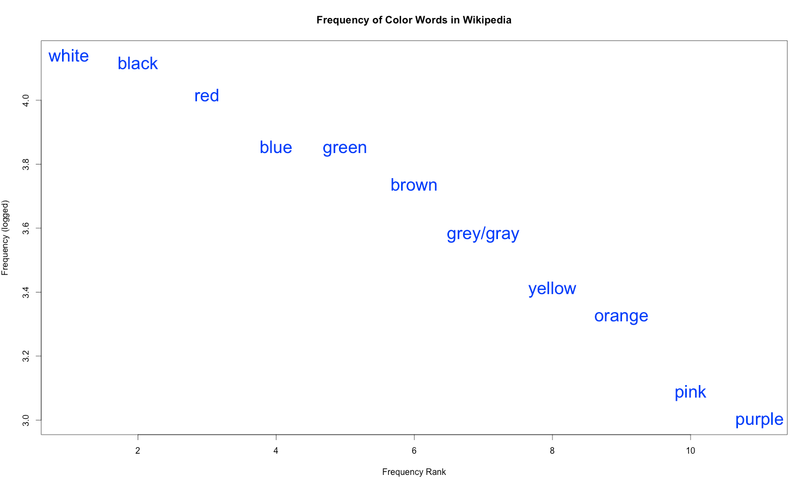 Interestingly, the rank order more or less follows Berlin & Kay’s hierarchy of color terms. When learning a second language, people learn better if they’re taught new vocabulary with a Zipfian distribution than if they’re forced to try to remember all words equally well. Another cool thing about Zipfian distributions is that is seems dolphin communication shares this trait with us. But, Zipf’s law isn’t the be-all-end-all of language. Lots of things have this curve (populations of cities, for example). So, as with all statistics, take it with a grain of salt.